Image of Jessica Porter Warren’s emaciated horses taken by the Los Angeles County Department of Animal Care and Control. LANCASTER- A 72-year-old Lancaster woman pleaded not guilty Tuesday to animal cruelty charges stemming from the discovery of more than 20 malnourished horses on her property last year. Jessica Porter Warren is charged with 10 felony counts of cruelty to an animal, along with one misdemeanor count each of failure to care for an animal, failure to provide shelter and injurious conditions, according to Deputy District Attorney Amarilla Blondia. The case stemmed from an incident that occurred June 20, 2018, at Warren’s property on 247th Street East. 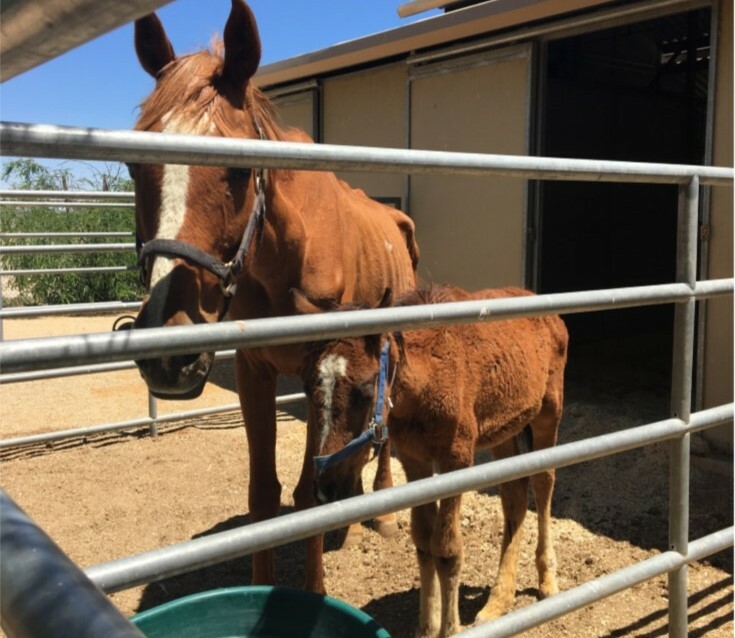 Los Angeles County animal control officers responded to a call about a dead horse at Warren’s property and discovered more than 20 horses in bad condition, according to testimony presented at a hearing in which Warren was ordered to stand trial. Two of the horses died while authorities were at the property and two others had to be euthanized later, according to the prosecutor. Warren was arrested Feb. 20, according to LASD inmate records, and she has remained jailed since her arrest with bail set at $200,000. If convicted as charged, Warren could face more than 10 years behind bars. A pretrial hearing is scheduled April 18 in Dept. A21 of the Antelope Valley Courthouse. 6 comments for "Lancaster woman ordered to stand trial for abuse of horses"
I have been on her for years when I put her BFF in jail for the same exact thing. I am so happy they didn’t drop the ball when I left the state. Justice will get served for those poor souls. She is such a fraud it’s not even funny. Seems unfair that she sleeps on a mattress & gets fed regularly & medical care when those poor souls weren’t afforded any of the same. She always had an excuse for why her horses were thin. THIS time she tried to blame it on a horse she adopted – supposedly HE had worms and contaminated her whole herd!!! However, it takes a LONG time for horses to get THIS thin, so if she saw they were losing weight, then she should have wormed them – you can get Ivermectin on sale for $2/ tube. But it does Not surprise me that she claims she is “not guilty” even though the Horses are living (and dying) PROOF! I am VERY glad that she has been held in jail all this time – because her Horses were suffering for a Long time. I just hope the judge and jury stand their ground and really apply the law. I know all about it. She is GUILTY no doubt.